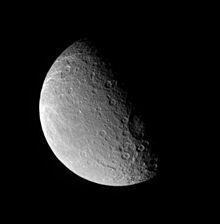 Tirawa basin is a large impact crater on Saturn's moon Rhea, at 34°12′N 151°42′W﻿ / ﻿34.2°N 151.7°W﻿ / 34.2; -151.7Coordinates: 34°12′N 151°42′W﻿ / ﻿34.2°N 151.7°W﻿ / 34.2; -151.7. It was glimpsed by Voyager 1 during its flyby of the moon and later photographed in greater detail by the Cassini orbiter. Tirawa is 5 kilometers (3.1 mi) deep in places, as measured in NASA Voyager images, and is 360 kilometers (220 mi) across. The crater has a slightly elliptic outline and an elongated central peak complex suggesting it was caused by an oblique impact. Tirawa overlaps Mamaldi, a larger and more degraded basin to its southwest. ^ "Tirawa". Gazetteer of Planetary Nomenclature. USGS Astrogeology Research Program.